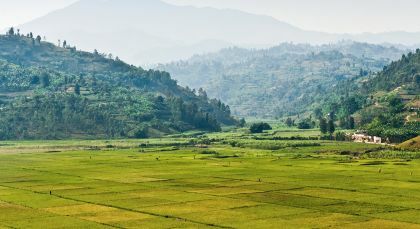 Travel to Rwanda and Tanzania for a unique insight into the diversity of East Africa. Go gorilla trekking in the rainforests of Rwanda, head out on a classic safari in Serengeti National Park, then head to Zanzibar for some chic island relaxation. Bliss! As Rwanda’s capital and its geographical heart, Kigali is an important business center and port. Observe gorillas! Volcanoes National Park is part of the Virunga Mountains protected area, also part of Congo and Rwanda. No other wildlife encounter in Africa matches the astounding experience of spending time face-to-face with some of the few remaining wild mountain gorillas. For a gorilla trek you need to be fairly fit for the humid, muddy conditions of a rainforest hike. Even in the dry season, the rainforest is a challenging environment: it is humid, wet and muddy with some steep slopes and thick vegetation. It is absolutely worth the effort to spend time with gorillas in the wild, but be prepared to exert yourself on the trek. Your professional guide and tracker lead you into the forest’s secret paths, looking for a habituated gorilla family. 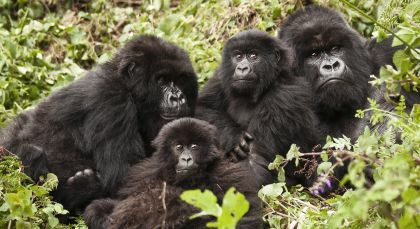 Once found, approach the gorillas quietly and settle down to observe them from between 7 and 10m away. You will spend up to one hour with the gorillas, watching the adults forage and groom each other while the babies tumble and play. You will be under the watchful gaze of the great silverback patriarch whose soft brown eyes constantly sweep over his family protectively. Witnessing gorillas express typically human gestures and emotions is a truly profound experience! Nestled at the base of the Great Rift Valley escarpment, Lake Manyara National Park is stunningly beautiful. 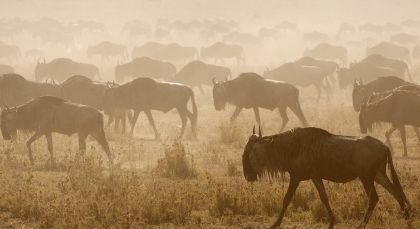 Further on, the Ngorongoro Crater has one of the highest wildlife densities on earth. 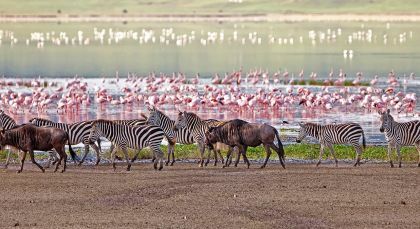 Look out for flamingos and tree-climbing lions in Manyara National Park and experience the jaw-dropping grandeur and wildlife of Ngorongoro Crater. The Serengeti is the jewel in the crown of Tanzania’s parks and undoubtedly the best-known wildlife sanctuary in the world. Get close to the fine detailing on the canvas of central Serengeti on game drives that offer a spectacular combination of wildlife viewing and bird watching. Setting out twice a day from Dunia camp, these game drives give you a chance to immerse yourself in the African wildlife and experience the serenity among the multitude of animals. Guides with sound expertise will accompany you and give you insights into animal behaviour, without compromising on basic creature comforts. You can watch lions and cheetahs, smaller game, as well as the rare black rhino on a lucky day. Explore the stunning beauty, diverse landscapes and amazing wildlife of the Serengeti on morning, afternoon and full day game drives. 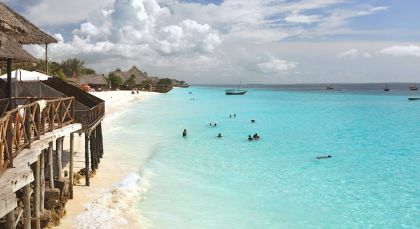 Head to the spice islands! The lure of Zanzibar is legendary and worthy. Accommodation (on a twin-sharing basis) on the indicated meal plan for 12 nights. East Africa: Flying Doctors emergency evacuation cover. East Africa: Exclusive use of high quality and well maintained safari vehicle with professional English-speaking driver guide. Game drives may be shared with other guests of the lodge/camp, with maximum of 6 guests in the vehicle and guaranteed window seat for all passengers.